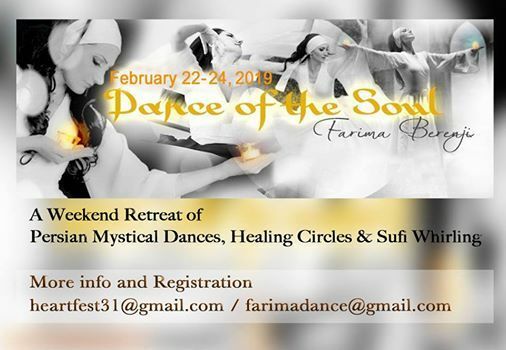 Join us for a weekend of healing, awakening, and self-growth through the power of meditative whirling and sacred dance with live music, mystical poetry, and Sufi whirling. We will create a sacred supportive space where we can all release energy that no longer serves us, relax and open our heart, body, and mind to further explore the magic within us and the spirituality about us, then come into trust and friendship on a deep, heartfelt level. We will open with sacred and mystical poetry and meditation, journey into whirling and sacred dance, then close our gathering with chanting, drumming, and sharing. Lovers, Seekers and Watchers – Come and join our sacred circle. You are welcome to set and feel healing energy, bring a poem or story or music to share, join our healing circles, pray with us, and just laugh or cry…as we journey together to be closer to the light. Musicians – bring your instruments and join our music circle. Let your heart guide your music during our open floor Sema. Please wear comfortable clothing (white or light coloured if possible) and bring socks or soft soled shoes to wear). An in depth whirling and dance journey covering various spotted and non-spotted turns, spirals and circles based on Sufi whirling traditions, sacred geometry, sacred elements, and ancient Persian rituals. 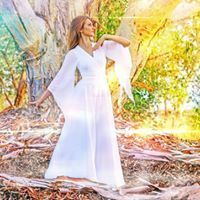 We will connect with the cycles of our life and discover the power of whirling as a gateway for self-growth and spiritual transformation! We will discover the power and mystery of ancient dances and rituals through movement, music, love, and stillness. *Farima’s unique meditative element breathing technique, relaxation and visualization. *Basic technique of various whirling such as maintaining balance and posture, controlling dizziness, and self-focus. *Turns, circles, and spirals, based on ancient Persian, Turkic and Central Asian Sufi Traditions. •Ancient Persian Shamanic healing rituals and Medicine Dance. *Poetry in Motion: Expressing inner feelings, motions, and movements through the written feelings of poetry (whirling or dancing). Magi (Ancient Iranic Shamanic Master), Dervish and Sufi Dance Master. Farima is an award winning, internationally acclaimed performing artist, instructor, dance ethnologist, and archeologist. 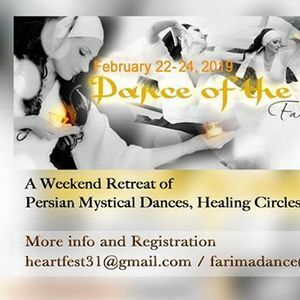 Recognized as one of few world experts and scholars of Persian dance history, Farima infuses spirituality into her dance and teachings to impassion, empower, and inspire. A Dervish and travels worldwide to research, perform, teach, and inspire dynamic creativity and rejuvenation through dance. Farima is founder and artistic director of the Simorgh Dance Collective, a member of the International Dance Council (CID-UNESCO), and a 2018 TEDx lecturer and performer. **INCLUDES: 2 nights accommodation (Friday and Saturday Night), meals, workshop fees and all activities. Retreat starts Friday 5 pm with an open ceremony, dinner, sacred dances, and healing circles.